I still pack bento-style lunches for Pierce each week when he goes to preschool, I just haven't had a chance to blog about them. So I figured I'd take the day off from Muffin Tin Monday to share a bento lunch instead. I recently found some cute lunch boxes on sale at J.C. Penney's for $3.99. In addition to the shark box, they also had a pink mermaid. The box is deep which is nice for larger items, and it has a tray that lifts off the top that is just the right size for a sandwich. Pierce had a green egg (with I Am Sam drawn on by my food writers), two cheese skewers, a veggie calzone (stuffed with sneaky spinach, broccoli, mushrooms, garlic, tomato sauce and cheddar cheese - I'll post the recipe at some point because they are easy to make), 2 condiment containers - one with raisins and one with cranberries, and a kiwi. These lunches continue to be a hit, and Pierce often says that lunch was his favorite part of the day! I love the box! JDaniel would too. Your sneaky calzone really looks amazing. I love all the great things you put in it. Thats a fantastic lunch. I love the lunch box container. It makes them happy to experience lunch. Eat Healthy. I look forward to the calzone recipe. The 10 year old is a pain trying to get to eat anything other than green beans...which there is nothing wrong with them, just don't want to burn out on them. I had made spaghetti with spinach in the sauce and he never new. I hate the fact I have to hide green vegetables to get him to eat them, especially when Buddha Bear loves them. I mean the Buddha Bear loves kale. I like the little box too. I need to get some of those condiment cups. Love the way you sneak in the veggies. You are so creative. I love that lunch box! I hope they have them at our Penny's. Won't be able to get there until the weekend though... How nice they had them for $4! That lunch looks very yummy! Can't wait for your recipe either! Super cute! My son loves sharks--I need to look into this! Very cute. Nice that they are a hit. RE your comment on my blog: Different works too. :-) Even in today's cookbooks, sometimes we get a gem of a recipe, and sometimes we really wonder what they were thinking. Lunch would be the favorite part of my day too:) You are so clever! They would be a hit with me too. That looks yummy! What a cute lunchbox and your arrangement is beautiful. Thanks for also being one of my "good" commenters! I appreciate your support. how do your kids eat their veggies? I have to puree them and sneak them into the food. Please teach me your ways, I mean they eat some veggies but not like your Pierce. What a good boy. Healthy lunch for anyone, not just a little guy! Looks great! Don't show my kids, mmkay? 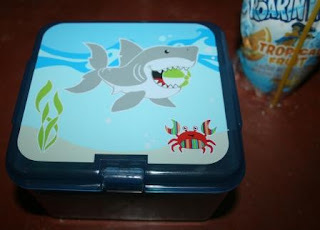 My babe would love that lunchbox, he loves sharks! I hope you do post the recipe for the calzone, I'd love to have it! I'd like to have you make my lunches, I never eat that good. what a fun lunch!! 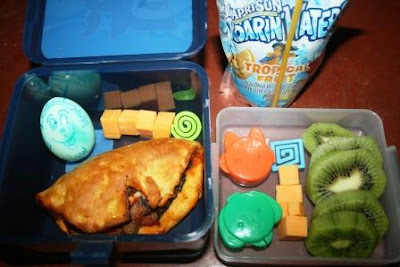 Adrian loves his bentos too...he now is so used to it, he tells me I need to take a picture before he eats it! That is such a cute lunch box & LOVE all the goodies you put inside. If I didn't have sick kiddos I'd run to JC Penney & see if they had the pink mermaid ones.